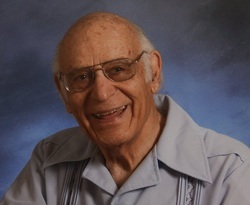 Berge S Najarian, 91, of Bradenton, Fl. died February 19, 2016. Private Memorial will be held. Survivors include his son David (Barbara) Najarian, sister Louise Villaseca and four grandchildren. ​Arrangements by The Good Earth Crematory. Rev. and Mrs. Berge Najarian served as missionaries for 25 years in the Middle East, Caribbean, and Africa. Rev. Najarian was born in Egypt where his parents were refugees as the result of the Armenian massacres in Turkey. Later he grew up in Jerusalem where he first came in contact with the Church of the Nazarene. He received his A.B. and Th.B. degrees from Eastern Nazarene College, and in 1954 graduated from Nazarene Theological Seminary with a B.D. degree. Mrs. Doris Roberts Najarian was born and grew up in Newfoundland, Canada. She attended Eastern Nazarene College where she met her future husband. They have two married children, David and Mrs. Donna Green. After pastoring in Florida for six years the Najarians were appointed missionaries in 1960 and began their missionary career in Beirut, Lebanon. In 196l they were transferred to Jerusalem where they lived for 15 years, supervising churches and day schools, preaching, and building churches on the Jordan-Holy Land district. After returning from the Middle East the Najarians had two assignments in the Caribbean. Their last assignment was in the country of Zambia, Central Africa. The Najarians were in Alabaster, Alabama, for their 227th Faith Promise revival when Doris was called to her eternal reward on October 12, 2000. Since returning from Zambia, Berge says, "God has given me a special ministry through more than 260 Faith Promise revivals. The cause of missions has advanced, souls have been saved and sanctified, and believers edified. To God be all the glory and praise! Since my dear wife, Doris, went to be with the Lord seven years ago, I have been having a growing intimate love relationship with Jesus!"